Congratulations to S. Klintworth who placed the winning bid of $2,000 for Junes's silent auction painting "Old Water Tower", by Mikhail, F. Grachev, estimated at $4,000- $5,000. 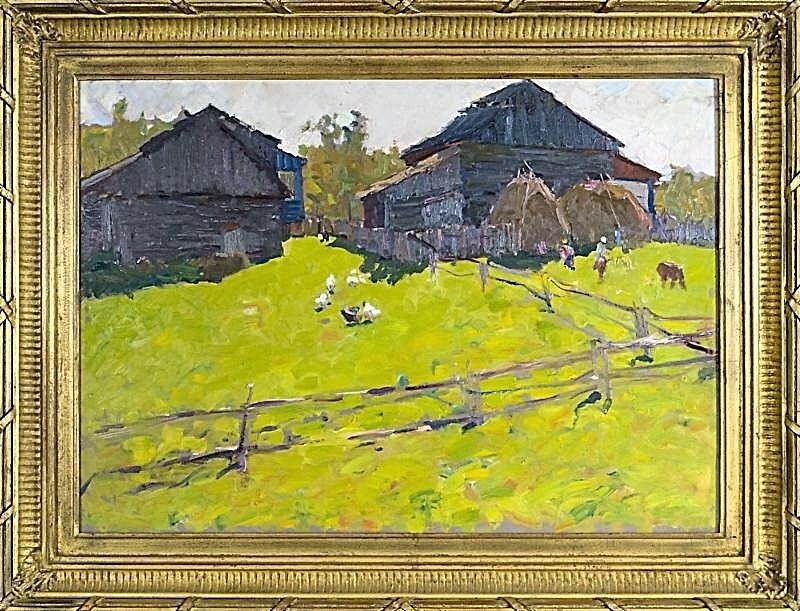 We are pleased to present as our July silent auction selection a wonderful abstract landscape, "Village Summer", by Konstantin K. Kalugin, estimated at $3,000- $4,000. Born in 1910, Konstantin K. Kalugin lived through many exciting, yet tragic times. The Communist Revolution of 1917, World War One, the Russian Civil War, Collectivization, the Great Patriotic War where he fought against the Nazi's and finally Stalin's purges. Despite all of the horror and violence Konstantin experienced, he followed his passion for painting. His talent was first recognized as a small child in he village where he was born. He then went on to attend a regional art school and later graduated from the renowned Repin Academy in St. Petersburg. In 1970 Kalugin was awarded the title of the Merited Artist of the Byelorussian Republic. Konstantin, through his art, forgot the horrors he lived through. He honored the beauty and tranquility of his Motherland with landscapes from the heart. The beauty of a simple, peaceful village, a farmhouse, children paying and chickens roaming were to him the greatest tribute to those who perished.The Soviet people embraced this artist. They loved and honored the man, the sacrifice and images. Tired of war, he returned to the simplicity of the Russian peasant life. His images are iconic and peaceful. Konstantin's landscape "Summer Village" painted just five years after the end of the war is an act of liberation and defiance. The craftsmanship is superb. The colors bright bold and optimistic. The work is a beautiful tribute to his people after unimaginable suffering. It says, simply, we won. And this is what we fought for. 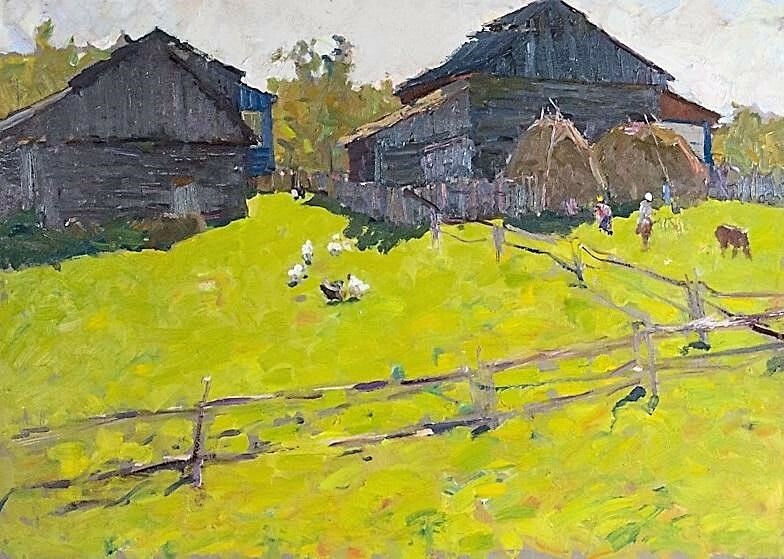 Konstantin K. Kalugin, "Village Summer"
We invite you to participate in this month's auction and thank everyone who placed bids last month. This is another exceptional opportunity to add a beautiful work by a noted artist to your collection. Estimated at $3,000 - $4,000, the current high bid is just $1,750! The next bid is $2,000, followed by minimum bidding increments of $250. Remember, there is no reserve, at the end of the auction the high bid wins! Bids will be taken via telephone, or e-mail until 7:00 pm MST, Tuesday, July 31st. Follow all the bidding updates on the Gallery's website. Konstantin Kalugin, a Minsk painter, Merited Art Worker of the Byelorussian Republic, was born on October 5, 1910 in the District of Shadrinsk of the Kurgan Region (Russia). In 1933-1937 Kalugin studied at the Pedagogical College in the city of Sverdlovsk where the family moved to. In 1937 he entered the Sverdlovsk Art College and studied there only three years. In 1939 Kalugin was called up to the army. Kalugin was a participant of the Great Patriotic War. On demobilizing, in 1945, Kalugin became a student of the Repin Institute (Leningrad). His teachers at the Institute were V. Oreshnikov, A. Mylnikov, I. Serebrjanny, Y. Neprintsev, B. Fogel. In 1952 he graduated from the Leningrad Repin Institute. The Arrest of T.G. Shevchenko in 1859 was his graduation picture. Kalugin's creative activity is greatly influenced by the traditions of Russian art and such painters as V. Surkilov, Valendtin Serov, Mikhail Vrubel, Ilja Repin, Isaak Levitan, Ivan Shishkin and Titian, El Greco, Van Deik and others. "To paint means for me to portray our Motherland," says Kalugin. Kalugin paints pictures, portraits and landscapes vividly depicting his native land in all its beauty, its history and present-day life. Land and its people are the main theme of P. Kalugin's paintings. His Organization of a Collective Farm in 1929 (1957), Land Collectivization (1967, a triptych), First Commune in Byelorussia (1969), Towards New Life (1972) reproduce very well the sweeping changes in the life of the Byelorussian village under collectivization. Former Marches (1958), Having Seen Off Those Leavings for the Front (1968). Before An Operational Sortie (1974) portray the feats of the people in the Great Patriotic War. In 1970 Kalugin was awarded the title of the Merited Art Worker of the Byelorussian SSR. Kalugin was a constant participant of All-Union, Republic and Region exhibitions. He was invited to to participate in several international art exhibitions as well (China, Romania, England, Poland and Japan).